However, I was able to find some vinyl and a nice print fabric from the part of my stash I can locate. I will have to go with what I have on hand and force myself to stay put and not run to the fabric store, much, I'm sure, to the satisfaction of my husband. So here we go. 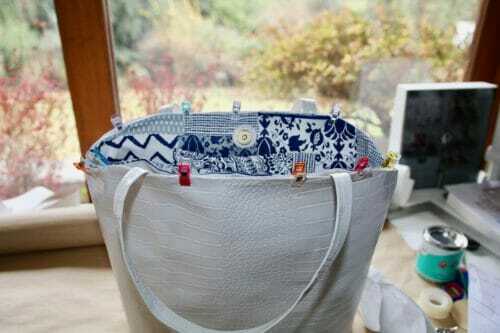 This project is for the temperamental person like me who gets bored with the same bag but is running out space in the closet so should not make another one. Ideally, this project is for the confident beginner who has made other simple bags and it is looking to expand her technique. 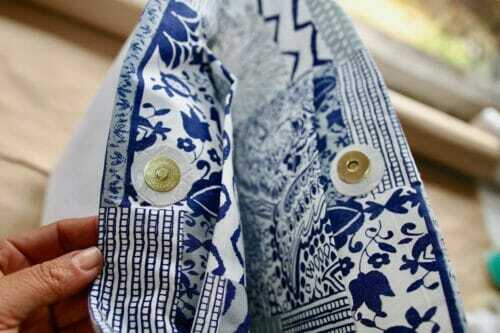 The ability to sew a straight stitch and cut fabric in a straight line is imperative since all the seams need to match. Tote bags are super functional and there are a plethora of fashionable styles. I prefer the kind I can change according to my mood and outfit. 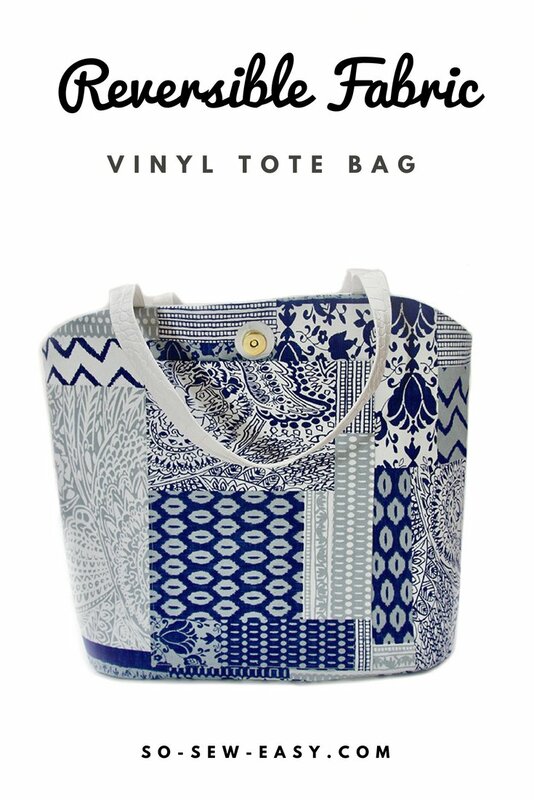 A reversible fabric vinyl tote bag is my way to go. The vinyl side for a more upscale look and the fabric side for a more relaxed outfit. On either side, there is a bag you can use with confidence and style. 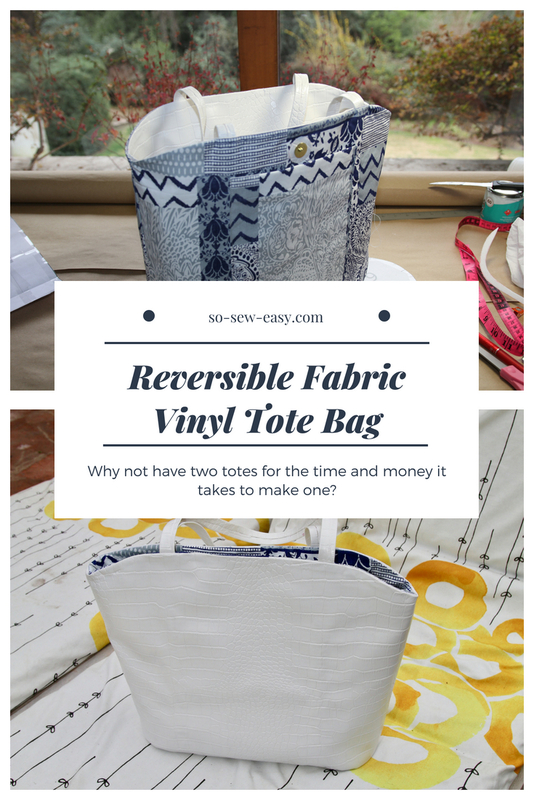 You can download the pattern for this Reversible Fabric Vinyl Tote Bag Pattern from our account at Craftsy. 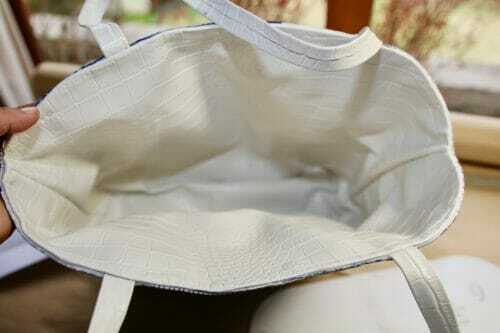 THIS IS THE FIRST PART OF THIS BAG there are another two tutorials coming soon. We are going to start this fabric/vinyl tote bag by making the handles. See my self-critique on the handles at the end of this tutorial before you start. We will sew the bag in stages, first the fabric and interfacing, then the vinyl. Lastly, we will put it all together. Cut two strips of fabric that are 44″ (112cm) by 1 1/2″ (4cm) wide. 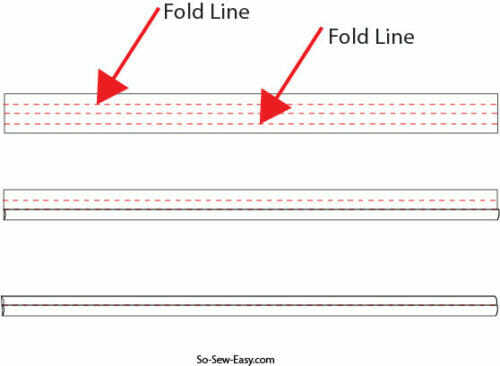 Make three lines 3/8″ apart, use the first and third ones as fold lines. Bring the edges of the handle to meet at the center by applying glue. Put the handles aside. I have left them overnight to dry. 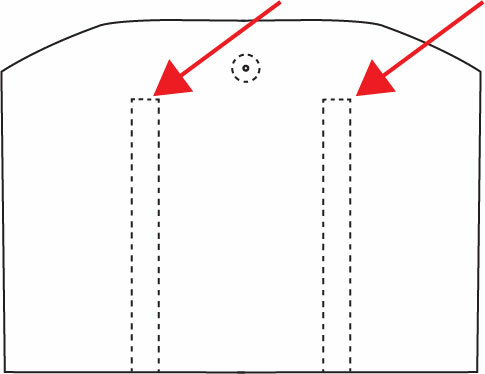 Mark the stitching/glue lines of the handles using your pattern. I have used an erasable pen. 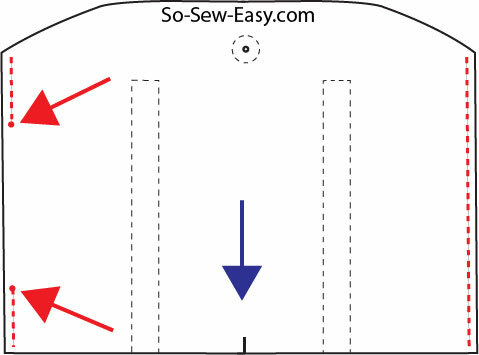 Apply glue to the wrong side of the vinyl along the area that is shown as a stitching line on your pattern. Leave the glue dry for about 5 minutes. Attach the strap to the glued area. 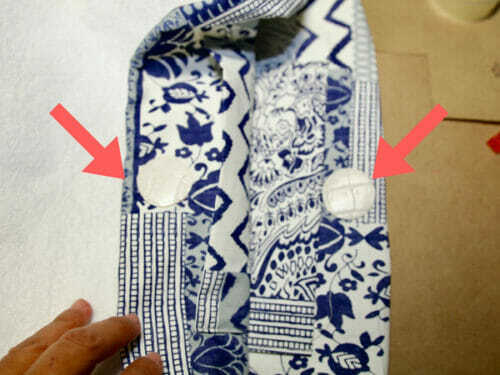 Mark the middle of the front and back of the bag as shown in the picture below marked by the blue arrow. 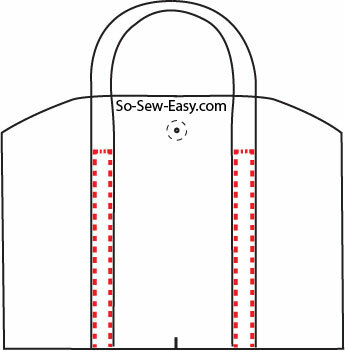 Place the right sides together and sew the sides at 3/8″ (1cm). Leaving a gap of 6″ (15cm) to be able to turn the fabric print side out. Glue the round vinyl pieces to the lining. Open a hole in the middle and attach the snap using a kam tool. If you are using a magnetic snap, wait until the lining and the interfacing is sewn together to apply it. Mark the middle of the front and back piece as it was done in the lining. Shown below in the picture below with the blue arrow. 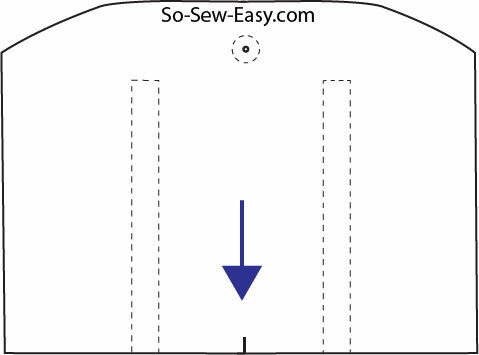 Sew the sides at 3/8″ (1cm). 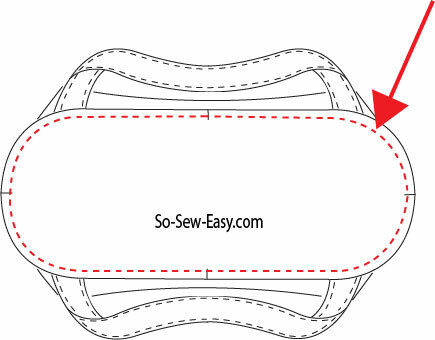 Sew the bottom at 3/8″ (1cm). 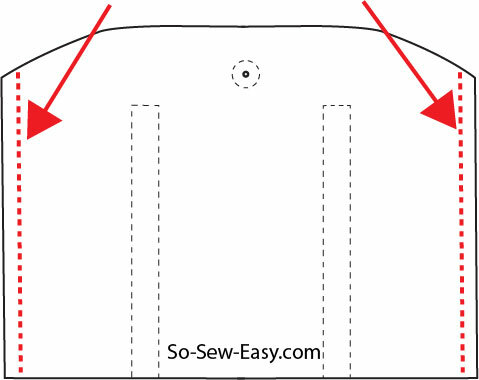 This part is tricky for the beginner so I suggest you read through the tips I have given you on this post to successfully sew a curved piece. Cut another bottom piece but take away the seam allowance and glue it to the wrong side of the bottom of the vinyl part. This step is so that the bag can stand on its own. It's optional but it will improve the look of your bag. Repeat with the stabilizer. We will have three layers of material that we will put together in the next step in a slightly different way. 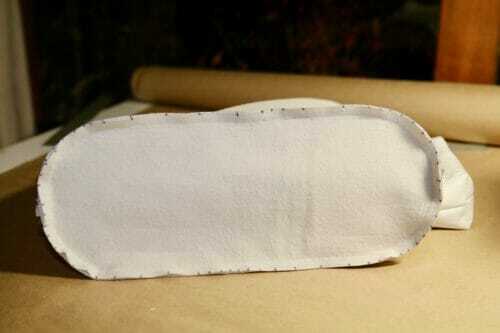 Turn and glue the edge of the bag 3/8″ (1cm). Finger press the edge to make sure the glue has taken both sides. Leave to dry for a few hours. In the meantime, we can sew the interfacing and the fabric together. Mark the placement of the magnetic snap over the small vinyl circle you have glued previously. Place the right side of both fabric and interfacing together. Sew the top edge will be sewn at 3/8″(1cm) making sure you will maintain strict seam allowance or the bag will not fit together. 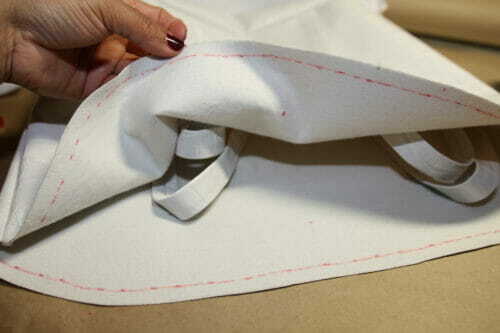 Reduce the seam allowance and turn the lining right side out through the gap you left on one of the sides. Iron the fabric and interfacing together making sure you leave a crisp top edge. Insert the fabric and interfacing inside the vinyl part. Use quilting, wired or easel clips to hold the layers together. 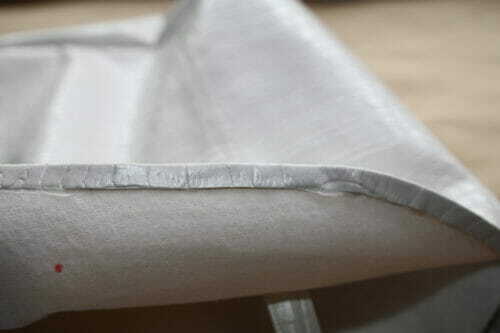 Apply glue to the vinyl layer limiting the amount to 3/8″ (1cm) then press the fabric/interfacing on top. This part will go slowly but it will join both sides together. Let the reversible fabric/vinyl tote bag dry for at least an hour before topstitching. 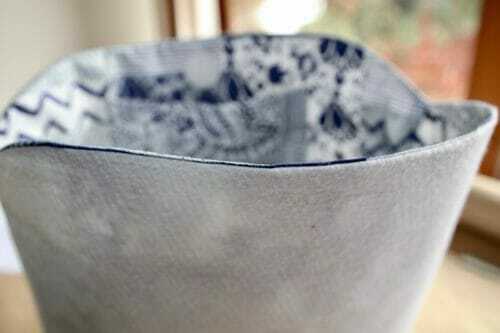 Finally, close the gap in the fabric by using a running stitch with a needle and thread. There are three things I would change to make the bag more interesting and better looking. Admittedly the weak spot in this bag are the handles. 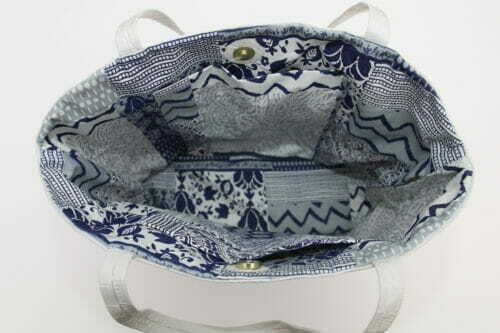 I would make the handles 3/8″ (1cm) wider and sew and glue a strip of the fabric on the side where the sides meet. I would also like to explore the use of patchwork on the vinyl side to make it more attractive and tie in the lining with the vinyl. So I am giving myself a B- but since this is my sample I will go back to the working table and improve on my observations. Do you agree with this critique? Join me next week when I will be showing you. How to turn any bag into a crossbody bag. How to make an adjustable strap for any bag. 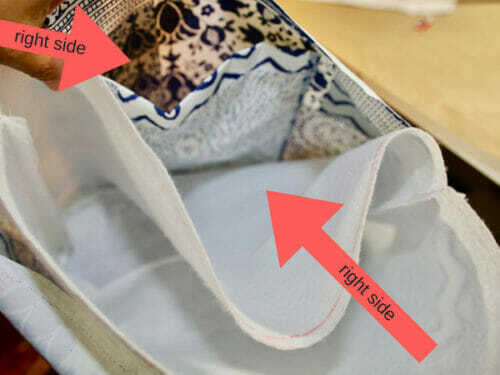 How to make a reversible clutch. I have to admit I am looking forward to your reversible fabric vinyl tote bag pictures in the comments. I hope you take on the challenge and share your pictures down below. I'm very curious to see what interesting combinations everyone will come up with. What other bag and combinations would you like to see? What would you add to the bag? Do let me know in the comments below. Happy Sewing! Trying to find the next part of this tutorial and have had no luck! Is there a link please? hello, can you tell me what is the room 1 (tab) and the square below drawn on the pattern. Is the interface composed of a simple cotton voile?. 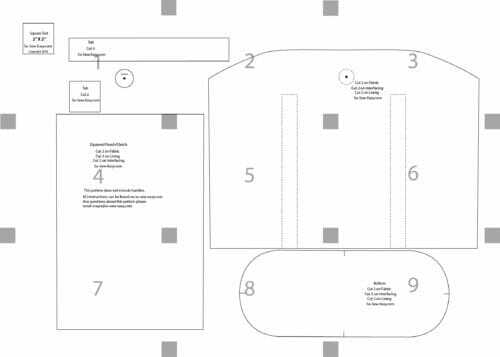 Thank you in advance for your response and thank you for sharing your sewing patterns. Hi Laurence you will not need it for this tutorial but you will when I will show how to make this bag using leather, just save it or put aside. Hi Kate, you are absolutly right! I forgor to adress that, it is an internal optional pocket. I will adress that on the video and thanks for taking the time to coment otherwise I might have forgotten it. Cheers! I made this bag, not reversible could be if i wanted it too, but used thick vinyl for the outside, nice bag and just made slightly smaller. The base dimensions still worked which was good. It’s a lovely bag made my straps wider, and inserted a pocket. I like zippers also, and have many bags with zips. I find the bag is quite deep and the magnetic strap works fine. Thanks and am now considering making it in all fabric. Would probably be less structured, but fine with me and use a zipper closure. Sometimes when you use vinyl which i did and made the straps wider you do find the straps can be too heavy for the bag. With fabric if they are wider you don’t have that problem. do you cut out the part on the template where the straps are supposed to go to mark the fabric? Hi Kristin, those lines are there just so you know where the straps go. Do not cut that material there please. Thank you so much for the detailed, well written tute! I read it forward and back 3 times and feel confident enough now to construct a bag like yours. Successfully. Pix may follow. I learn so much from you folks! Thanks for the excellent blog. You are most welcome Jane. Would love to see a picture when ever you are ready. Thank you love your patterns. This looks great. Love this reversable tote and the colours! blue & white is so clasic. Love the top shape of your bag, looks so professional. Only problem for someone like me those a lots of pockets person, didn’t notice you had any,. I suppose a bag organizer could be used here. This is one I made that’s reversable. 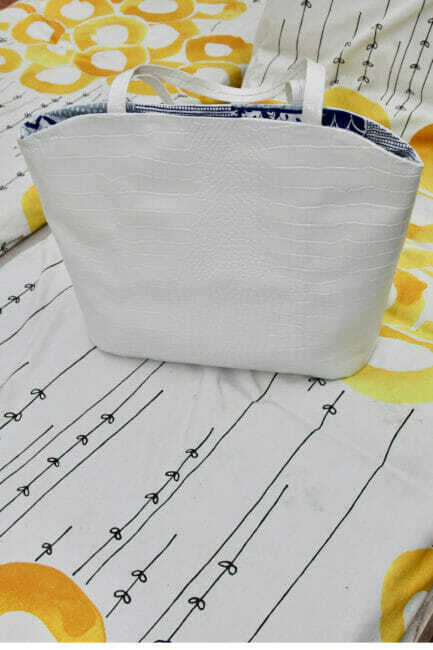 Hi Sharon, there are two pockets, but a clutch is coming that is supposed to go inside the bag coming soon, stay tuned. 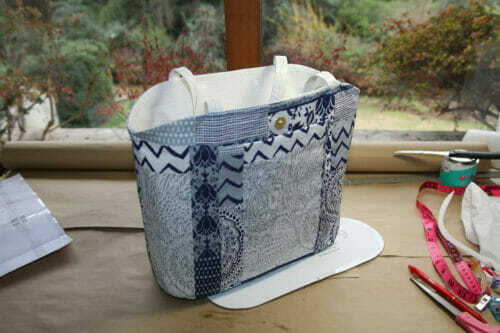 I made a reversable bag as a gift in a hurry the other day. Have two long panels on both sides of fabric side of bag for lots of pockets , and it’s not too noticeable because it’s of the same fabric. I think I will try the bag with some leather I have in place of the vinyl. Thanks for the pattern. yes I think the use of leather would be ideal. 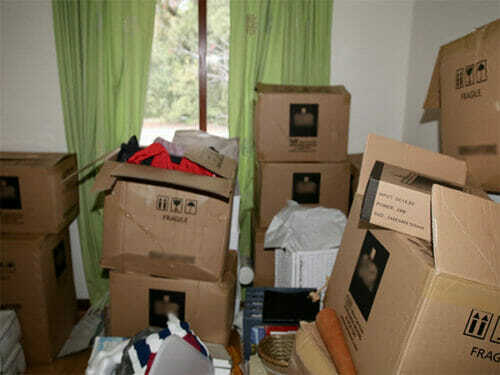 Do post a picture when you are done it would be so nice to see. This is an attractive bag. I like the shape of it and I agree the handles could be a bit wider. I haven’t yet made anything with vinyl but would give this a go. My favorite bag from your site is the Cross Body Bag, I love it! I’ve made it twice and plan to make another soon. I’ve also made the Lucy Tote. I purchased the Carry-All pattern but haven’t made it as yet. Great patterns from a great site. Having the videos to follow are an added bonus and are VERY helpful for when you need a good visual! This bag is adorable. What is the finished size? HI Nancy, the bag is Height 12″(30.48cm), wide 16.75″ (42.55cm), depth 5″(12.7cm). HI Terra, great suggestion, my bag is not finished yet…but I think you idea is superb! I have not sewn vinyl before. Is there a particular sewing machine needle you recommend? Any change to thread type or stitch length, or other tips? Hi Dawn, vinyl is not complicated and the tips and tricks can be found in this tutorial. I’m not fond of the snap pieces showing on the fabric side. Is there some way to cover them? Would rather not have a reversible than to have a bag that looks like I turned it inside out. But I do like the pattern and shape of the bag. Very nice! I agree with LadyD about a zipper closure. I would love to see a beach tote using mesh pet screen and fabric. I see lots on line but no how to’s and I need the how to! I just love your bag as is! The thin straps remind me of all the Luis Vuitton bags I see people with, which all have skinny straps. I think yours is perfect, from the elegant white alligator look on the one side and the tasteful patchwork fabric on the other. If I were to make it I would recreate yours because I don’t think it could be s improved 😁. What is the adorable white fabric with yellow rings that you photographed the bag on & where did you buy it? Hi Akane it is from Ikea, I bought it to cover the lounge chairs and had some left over to make the small backpack. A very pretty bag & I like the versatility of it being reversible. I agree the straps should be wider and there should be fabric sewn to their unfinished sides. I would also want a zippered pocket added to the fabric side. The link to the lobster claws actually goes to d-rings. Thank you I will look into it. In reading through the materials list and then looking through the instructions. I’m confused as to why lobster claws, a buckle, and two d rings are on the list? I wondered the same thing. A goof, I’m assuming? No it is not a goof, if you read at the end of the post, there is more coming to this bag than this post. I agree, the handles should be wider. And, I would add an additional snap closure to the top. One snap is too insecure. I actually prefer a zip closure over snaps for security reasons. This bag is adorable! For those not confident in matching seams it could be made without being reversible. The only thing I would change is the width of the handles. I give you an A.